Habit: Perennial herb to subshrub, 2--10+ dm, from woody caudex, glabrous (tomentose). 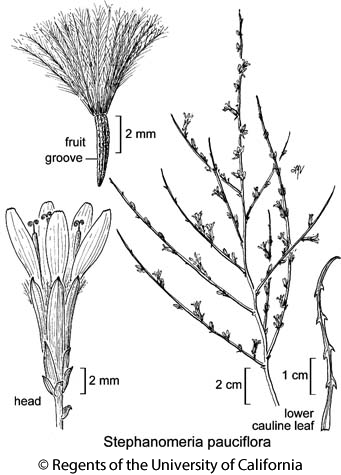 Stem: 1--5+, intricately branched, branches ascending to widely spreading. Leaf: basal withered at flower; cauline reduced, deciduous in age, distal bract-like. Inflorescence: heads 1; peduncle 0--10 mm; involucre 8--11 mm; outer phyllaries appressed. Flower: 5--6(8); ligule white or lavender-pink. Fruit: 3.5--5 mm; faces tubercled, grooved; pappus bristles generally tan, plumose on distal 80%, widened at base, basally fused in groups, entirely persistent or only bristle base persistent. Chromosomes: 2n=16. Synonyms: Stephanomeria pauciflora var. parishii (Jeps.) Munz; Stephanomeria pauciflora var. pauciflora; Stephanomeria runcinata Nutt. var. parishii Jeps. Citation for this treatment: L.D. Gottlieb 2012, Stephanomeria pauciflora, in Jepson Flora Project (eds.) Jepson eFlora, http://ucjeps.berkeley.edu/eflora/eflora_display.php?tid=5156, accessed on April 19, 2019.
s SNH, Teh, SnJV, SCoR, SCo, TR, e PR, SNE, D; Markers link to CCH specimen records. Yellow markers indicate records that may provide evidence for eFlora range revision or may have georeferencing or identification issues. Purple markers indicate specimens collected from a garden, greenhouse, or other non-wild location.